We traveled to another world on the wings of vivid descriptions of Ghanaian culture that enriched the dramatic story in which Peggy was selected to serve as the King of her ancestral home and undertook this daunting responsibility against many odds. 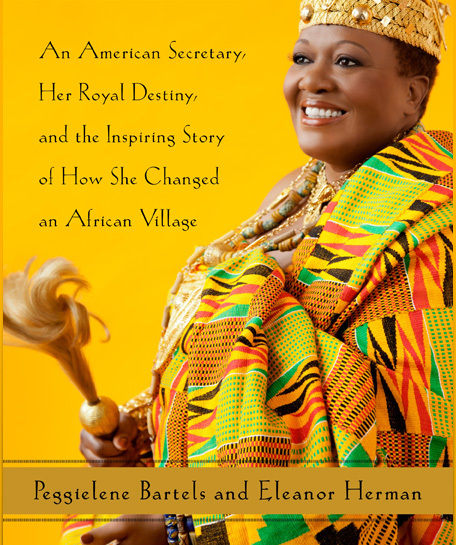 We learned that in her role as King, Peggy would be expected to wear traditional kente cloth for various ceremonies. Kente designs date back to the 17th century and the cloths are finely crafted and quite expensive. And blue for the sky, the home of the great Creator Spirit. If you have something to say about me, let me first give you a stool to sit upon. Back at her home in Washington, DC, where she still lives for most of the year, “Peggy opened her closet and looked at the row of black and brown pantsuits she usually wore to the office. King Peggy’s description highlighted the strange lack of deeper meaning that most modernized, Western people experience in their clothing choices. It brought to mind recent discussions with girlfriends about their frustration with the bulk of boys’ fashions. They didn’t want to only clothe their sons in neutral solids and stripes. They appreciated their sons attraction to graphic tees and balanced images that convey masculine qualities, but were annoyed by all the graphics that imply that our sons should be aggressive like ferocious animals gnashing their teeth or reckless like a motorcyclist wildly flying over a hill. What about cultivating other aspects of their souls than pumped-up power or courage gone wild? And how about girls clothes in this culture? I recalled the frequent gripes of mama-friends equally repulsed by the onslaught of pink graphics splashed across oddly-tight girls’ tops pronouncing their worth as pretty princesses to the world. JCPenny took the degradation prize with their 2011 girls’ shirt with cutesy letters that read “I’m too pretty to do my homework so my brother has to do it for me.” What messages are we as a culture sending our girls? The mamas I know agree there is an appalling deficit of balanced, gendered or gender-neutral clothes in mainstream stores that supports an unhurried, uplifting, empowered childhood. But King Peggy’s cultural comparison ultimately gave me hope. What’s to stop mainstream Americans or modern urban cultures worldwide from choosing clothing with symbols meaningful to our souls? We humans innately crave beauty and truth, so why not? Around the seventh time the kids asked if we could please turn King Peggy back on, I emerged from my reverie. And instead of feeling sad for or frustrated with the culture of clothing in which I was raising my children I felt a new feeling of purpose. All this reinforced how real and relevant Tender Sapling’s goal of giving children concrete, positive images and activities to guide their souls to grow noble is. It’s not some strange concept that my husband and I hatched late one night after another depressing shopping trip to the mall. This morning, the truth that clothes with spiritual heft can work wonders sparkled clearly for me. When the two oldest boys brought their bickering to me, my eyes landed on their shirts. Instead of picking one of the many well-behaved animals, useful machines, or sports or nature images that adorn the bulk of shirts in their drawers, they had both chosen a Tender Sapling shirt with a beautiful graphic my husband had designed and named Love in Henna. It filled me with hope and a simple idea of how to handle the situation. I asked my angered sons to read the message on their shirts – LOVE – and see if they could draw in their Love to guide their actions. They both looked at their shirts. Their grumpy faces turned to smiles as they nodded in agreement. Armed with Love, they scampered off to find their next adventure. It was surprisingly simple. I smiled. My boys were wearing something as powerful as Kente: Clothing proclaiming to the world what they stood for. Clothing that was helping them through their day. Love in Henna – Love is the source of life, peace, purpose, and happiness. This Indian-inspired design is about celebrating Love. Love All the World – Love makes the world go round! Our love for our human family can light up the whole world. Tender Sapling – Our children are as tender saplings that we, as their parent-gardeners, nurture and tend on their paths to becoming mighty trees. With All Your Heart – A child’s pure heart can sing its beautiful song of love and life beautifully like this bird warbling her melody. 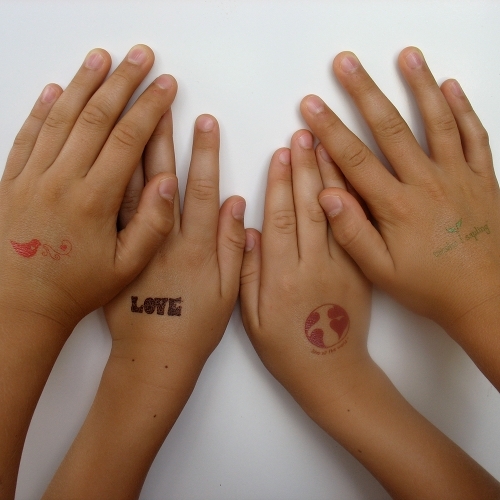 Our kids absolutely love the matching tattoos, which carry these positive messages further in a fun way! We are delighted to offer these inspiring designs and be part of a growing movement to create children’s clothing and products infused with positivity. 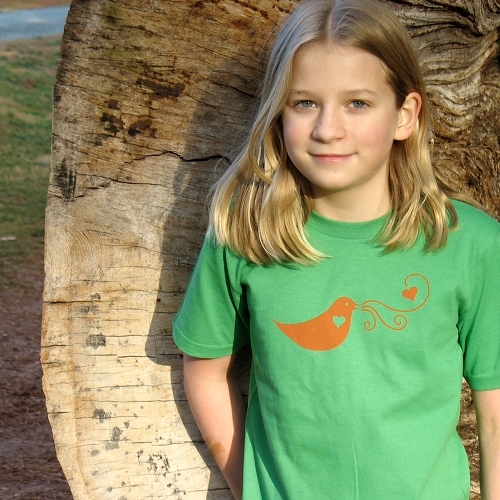 Plus our tees and bodysuits are all made of organic cotton with eco-friendly inks. And for DIYers or the budget-conscious, you can always create your own fun styles by stenciling on blank shirts, as we did with some of our early designs using the freezer paper method beautiful explained by the Artful Parent. Whatever clothes your child is attracted to wear, we wish you a meaningful journey in clothing and raising him or her. May she stay true to herself and have fun growing noble! 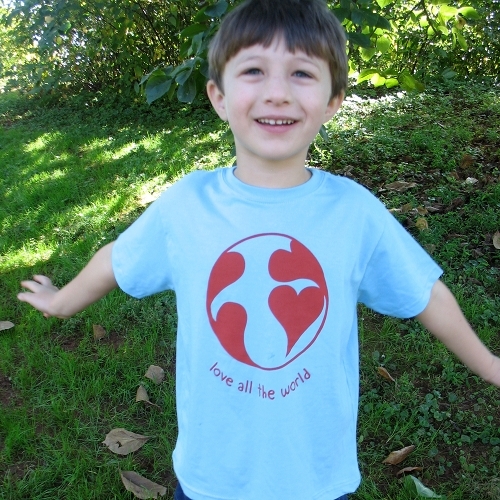 What are some virtues you’d love to see celebrated on your kids’ clothes? I love this! What a great message for kids. I’m going to look for that book about the Ghanian-American-turned-royalty. Kente has always been fascinating to me, and I’d love to learn more! (Becky from kidworldcitizen.org our fb group;).